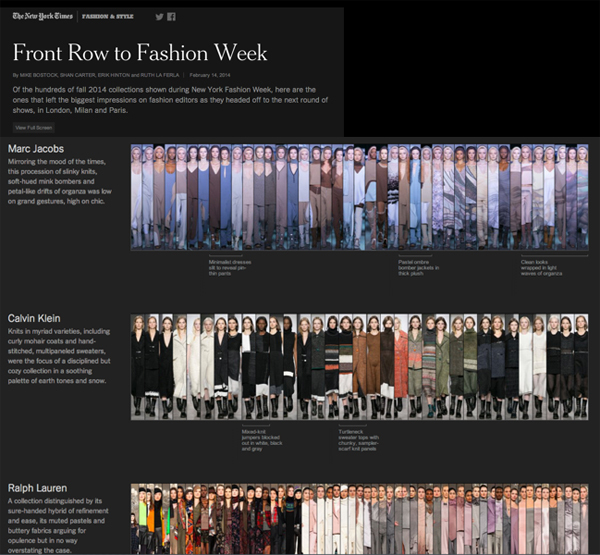 Home » Posts Tagged "dull hair"
The New York Times has done something extraordinary with their Front Row to Fashion Week, the most amazing presentation, visually stunning, useful and informative too. I show only a few of many designers here and you can click on each photo to make it larger. They say: “Of the hundreds of fall 2014 collections shown during New York Fashion Week, here are the ones that left the biggest impression on fashion editors as they headed off to the next round of shows, in London, Milan and Paris.” Congratulations Mike Bostock, Shan Carter, Erik Hinton and Ruth La Ferla. Click here for the stunning presentation of all you need to know about fashion for fall. However, while everything you need to know about fashion for Fall 2014 is here, sadly, once again, there’s not much inspiration on the hair front. There is some, but most of the runway hair was dreary, boring, often over-greasy, dirty looking, over-messed up hair or that old load of nothing stand-by, the ponytail and this is what walked the runway in almost every show, nothing much new. I just can’t compute how fashion designers design new fashions for shows season after season, yet hairdressers can live with themselves by doing the same old hair season after season. Yes, the designer wants safe hair, and the designer rules, but surely the same interesting hair on every model won’t take away from their fashions and would make their designs more interesting, just as accessories can do. Hairdressers surely could motivate some designers with some more exciting yet appropriate hair ideas for Fashion Week shows. Perhaps hairdressers should unite, become a stronger force, just as fashion designers have, to get out of this stagnation, this sad state of hair ideas which does nothing to inspire the mere mortals out there to wear their hair in something newer than the same look they are all wearing, long, ponytailed too many days but not, thank goodness, all greasy, stringy, and dirty-looking!! And not as messy as fashion designers, fashion stylists and hairdressers seem to think is the way people want to or should wear their hair. It is not. Please, dear hairdressers, fashion designers, fashion stylists, please show more interesting hair next season … but I am not holding my breath, because while everyone from fashion designers to magazine editors and the sponsors – and the hairdressers – accept dreary hair and the ponytail as a fashion trend year after year, nothing will change.